I-30 exit 207 goes directly into the Main Gate. On weekdays, you must go to the Visitors Control Center, the brown building adjacent to, and west of gate entrance, to register and to obtain an MWR badge for each person entering the gate. Base stickers are not recognized. On weekends, the gate guards will give you the passes.DOD ID card and drivers license are required. When cleared, proceed through Main Gate to Texas St. (1st left) and turn left. Follow Texas St. approx. 2 blocks, then turn right onto Avenue K. Follow signs for about 7 miles to Elliot Lake campground on the left side. Go to office located in country store at end of road to register. Active, National Guard, Reservists, Retired, 100% DAV. All current Federal and State employees. DoD Civilians. Not accepted for camp sites. Accepted 6 months in advance for cabins only. Allowed in camp sites with usual leash and clean up rules. Need to ask permission for pets in the cabins. No commissary or gas station. 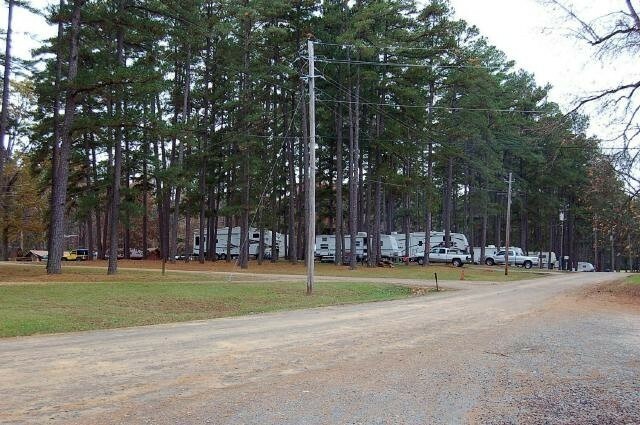 The campground is about 6-7 miles inside the gate away from everything. Bring your own linens (sheets and towels) and anything to eat, drink, or cook with (pots, pans, plates, silverware, etc.) for the "Cabins". Linens are supplied for "TDY Cabins". 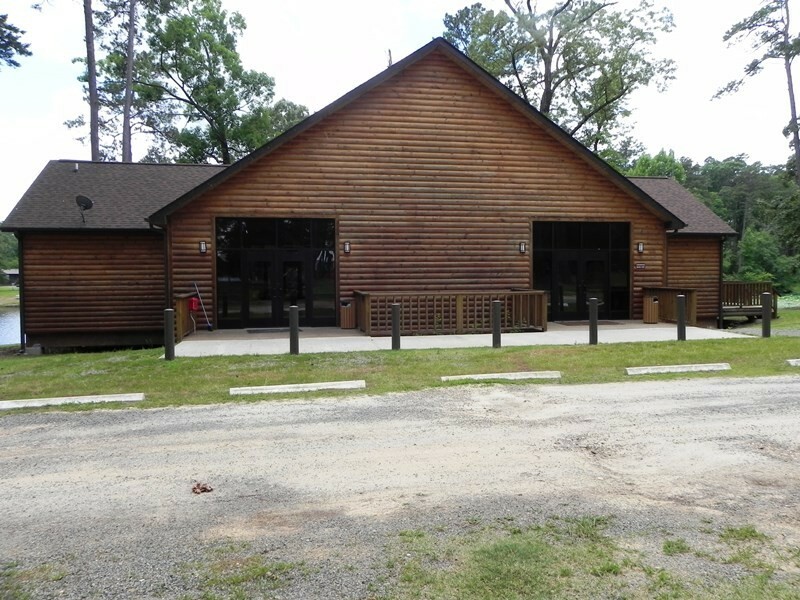 No stay limit for camp sites or cabins. 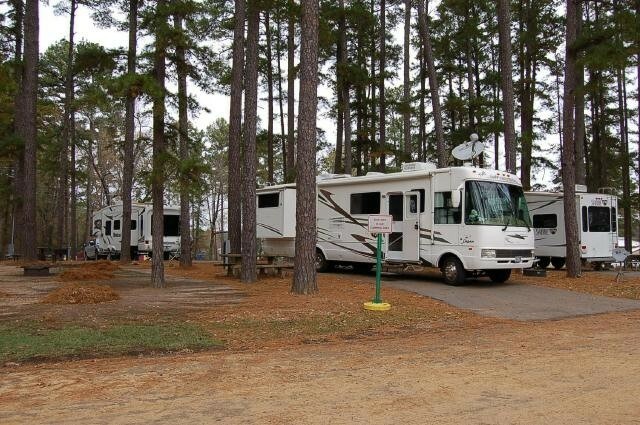 Some RV sites are marked with a 14-day limit. $3 a day Golden Age/Access/America the Beautiful discount available on RV sites. Equipment rentals: boats, canoes, kayaks, sail boats, mountain bikes, and bounce houses. Small store and 24/7 bathrooms available. Firearms are not allowed on post. 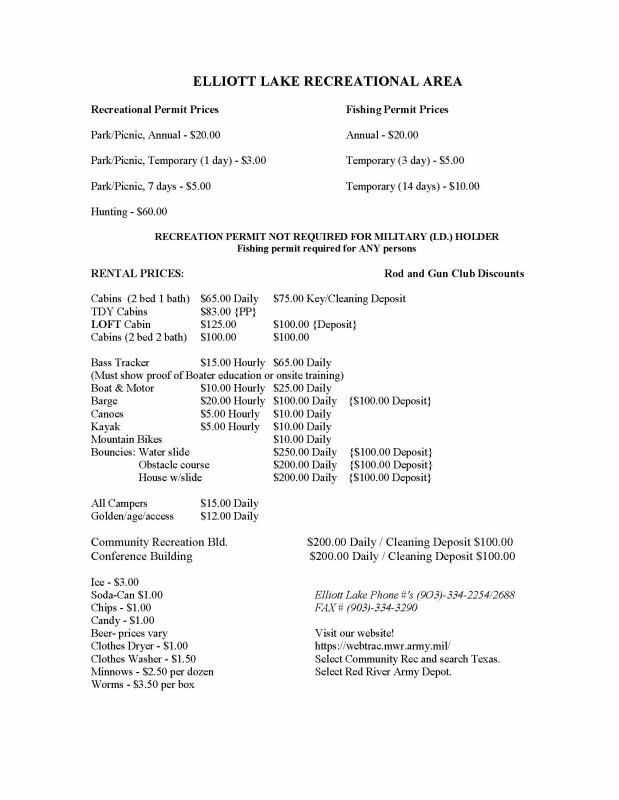 Pricing, rental info, map, and other information on the Elliott Lake Recreation Area, Red River Army Depot, TX. Got there on 08/06, left 08/08; Haven't been there in 18 months or so. Army gate guard told me I needed additional forms to gain entrance and was told I needed to go to the adjacent building to get it. Have never had this happen befoe. I had my dog in the car and can't have her in the heat of the car while I'm away. Opened windows for the dog, went in the building. Civilian there told me to get a new ID card without my SSN on it. I told her , "Aw come on!! I have my dog in the Jeep". Let me slide. Gave me a form to give to the guard so I could have access. I was in Texarkana on business and the next day I returned to the base. Another Army MP looked at my ID and told me I need a new ID because my picture is like 20 years old. I mean really?!!! KMA. The people at the campgrounds were great, as always though. Cabin cost $75/night. Can't beat that for lakeside views. I've been told that this is a partially closed Army Post, if so why civilian security guards? First you have to turn right before proceeding to the Gate and present your proof of insurance, vehicle registration and military ID to civilian personnel. Be very careful the parking area is very tight, my 39' plus tow was extremely tight. Turn right out of the parking lot and proceed to the Gate. They will then have you pull over and inspect your motorhome while you and your family stand outside. If they are happy with the way it looks you can proceed to the campground. I will not come here again. They performed a "search" not an "inspection". An inspection requires the owner's participation and to be accompanied, a "search" the owner stands by and watches. well where to begin?? let me preface with this, ALL the NEGATIVE associated with this place/review is due to the front gate/admin personnel and not the lake personnel... upon arriving we went to the pass/id office for our passes, as soon as i pulled out my older non-barcoded id card i was told that either i would have to go next door to get a new one or i would not be able to enter? i asked the clerk why he could not manually enter my info into the temporary pass system like they do at ALL the installations we visit in the united states? he said it would not allow him to do that? i told him that i was not going to go next door and get a new card as my card is VALID at ALL military installations in the good ol us of a!! he said this was the problem, this depot is civilian run and the rules were different, then he asked me if my wife was a us citizen(because she only had her drivers license with her in the office) i asked him if the provost marshal was a military member and if he/she was that he better make a phone call asap cause i was gettin mighty mad at this point!! the pm called back and after the clerk explained what he had told me the pm said to issue us a pass and let me get on my way, so after an hour of interrogation we were finally headed to the lake.... we went to the lake office to check in and was told to go find a spot, get set up and come back when settled, so i asked what spots were open, i was told this info was not avail so i would have to just go find an open spot? so we drove to the sites back towards the gate which you first pass on the way to the office, this is the newest location which has concrete pads, the others are dirt. so we grabbed the only open spot outta 15 and got set up(rest were full timers). all spots are very close to the lake and only take about 1 min to walk to the water. we went back to the office the next day to settle up and was told the registration system was going to be down for the rest of the week so i manually filled out a ticket and was on my way, after telling my gate experience to the camp office gal she gave me the contact info to the person in charge of those civilians so i could express my concerns, she then gave me a run down on the area attractions and we grabbed the fishin poles to relax and forget about things for a bit(even though i was still very agitated at the whole ordeal) so like i said once you get past the front gate and actually arrive at the lake to begin your camp vacation all is very very nice and relaxing, there are many items to rent at mwr for the lake and plenty of space for walking/running/biking/hiking or just relaxing!!! make sure you bring enough food so that you do not have to go off post, but if you need to there is a walmart in new boston 5 miles down the road for whatever you need including fuel. if it was not for the civilian personnel at the front who immediately ruin your vacation mood i would come back, but i just don't feel like returning because next time i will not be able to hold my tongue/temper at a staff who is ignorant to the meaning of an id card with no barcode and who forgets WHO this recreation area was made for!!! Awesome Rec Area, Teesa was wonderful, the tent sites were well laid out, the trails were nicely maintained, the water feature was an absolute joy... oh yeah My singular gripe is absence of somewhere comfy to go sit and get lost in a good book... but hey I can live with that. I will SO go back to this FamCamp, first 5.0 I've given, ever! Ummmmm yeah, ya gotta get a pass at the gate but the office staff were wonderful and delightfully knowledgeable as to where to 'go/see/do' in the area! We stopped over for one night at Elliott Lake on a trip to Virginia. We arrived late - around 2100 - and had a little bit of difficulty finding an open spot. They don't accept reservations and even though they have around forty or so spaces, many of them are filled with long-term residents. Most of the open spaces were reserved for 14-day or more camping only. Lighting is pretty poor so be careful as you negotiate the area at night. Signage is also pretty scarce and the layout of the park is not easily navigated (there are really three separate campsite areas, two of which are connected). For our purposes, the park was not convenient - located on the far southern edge of the post, about seven miles south of the main gate. 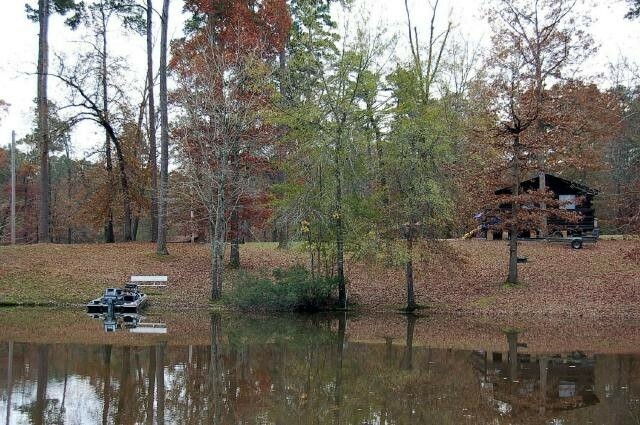 Having said all that, Elliott lake is a hidden gem in the East Texas pineywoods! 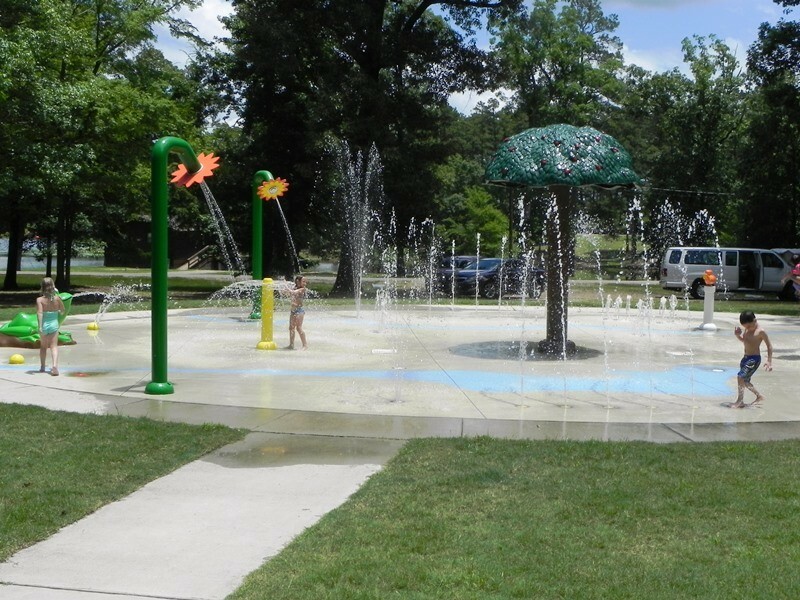 It's beautiful and remote and the perfect place to take the family for very inexpensive outdoor fun. As a late-night stopover on a trip, it's not ideal, but as a vacation spot, it's perfect. We can't wait to re-visit and stay for a longer time. Loved this campground. 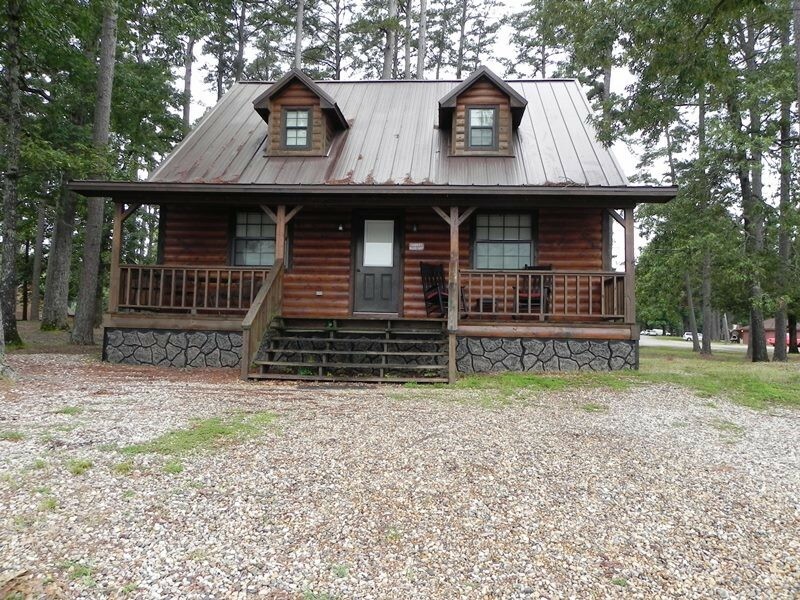 Great place, beautiful tall pine trees, large sites. They have a beautiful lake. WiFi is bad, but with a campground this beautiful who needs wifi. Staff was very friendly. Laundry and bathrooms are clean and we'll taken care of. We would definitely return. This is a great place to stay. 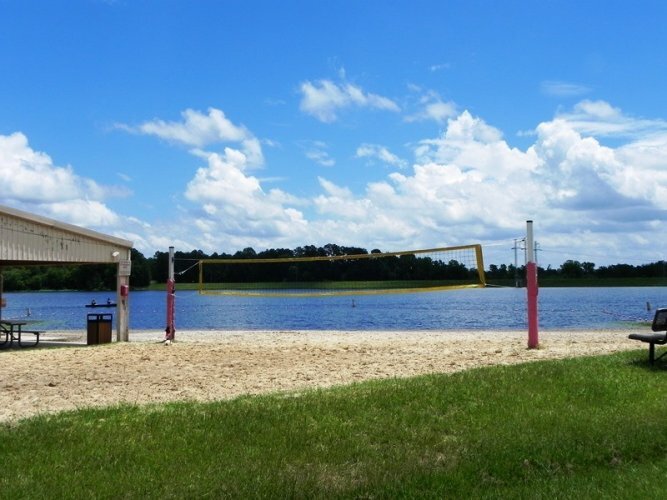 I was living here for a few months when we first moved to Texarkana and I loved living here at the lake. The trip into town was the hardest part of the stay, but there are oppurtunites to see nature everywhere. Be careful about your speed on base, even though the streets seem deserted at night there are security cops everywhere. A ticket on base requires an appearance in federal court in Texarkana. This place is a hidden treasure! You have everything here. 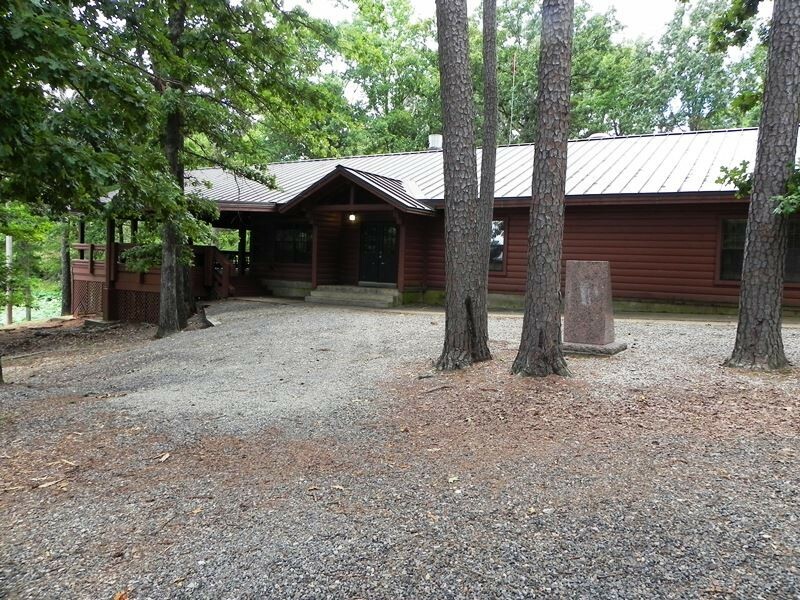 Swimming, boating (small craft) horse shoes, cabins, RV parking, movies on Saturday night outside, small store, Quiet, Quiet, off the beaten path for sure. There is a shoppette about 9 miles away with package store. This is a dry county. They have a gym, emergency medical. Great pizza right off the depot! No limit on your stay! Nice Park, well kept and support personnel are super friendly. 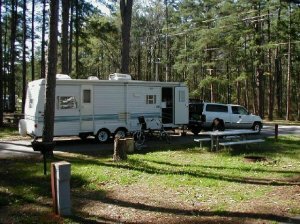 Had a fun time with pass and ID, great folks, easy to work with, very cordial, as with alot of military camp grounds lately, this campground has lots of extended stay people, but had room for a few travelers. Seems to be the norm now. Great place to stay and unwind. E.K. left this review using the Directory software: - First time at this campground. The GPS kept trying to take me off road to get to GPS coordinates. Called to contact number and received great directions to main gate and on to the campground. Found the host very friendly and helpful. 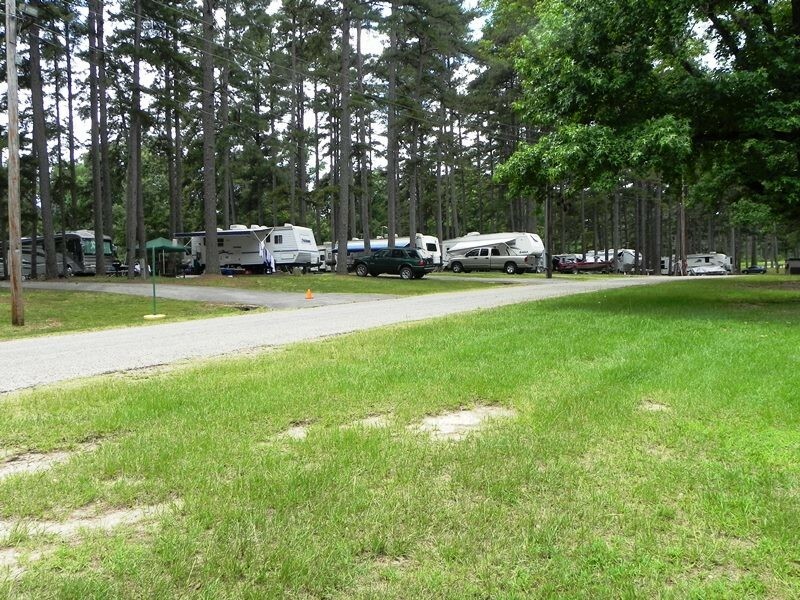 Campground clean and well kept. Will come back for an extended visit. I got here 10 Apr 2013. You have to register all your vehicles either with a permanent or temp pass, It's a ways into the base there is a new exit 207 on I-30 it leads you right into the main gate. There is an AAFES exchange about 2 miles west on US 82 it's a small one since this county is dry you have to get beer and liquor here or go into Arkansas. They have a new section with full hook ups so they don't have rest rooms or shore, if you want to use them you will have to go to the office building, they are not planning on putting any in the new section. Fire wood is plentyfull it's laying all over in the woods. The staff is very friendly and helpful. There are WalMart's on east or west directions on US 82 in New Boston or Texarkana. I enjoed my stay and recomend it and I will come back. J.N. left this review using the Directory Software: - Great fishing lake. Limited short time spaces. Need a vehicle pass requires proof of insurance, registration and drivers license. 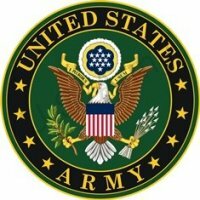 Only two permanent military, Cmdr and CSM. Directions into this facility and to the Main Gate (for trucks and heavy vehicles) were super. Getting stickers for our vehicles (something we had intended to do) was made easy by the efficient folks in the office just outside the Main Gate. We even had room to park and not unhook our tow vehicle! Our GPS read the streets, which are rather busy with lots of vehicle movement, and helped us find our way. The campground is really nice, with the older sites currently being upgraded to full hook-ups. 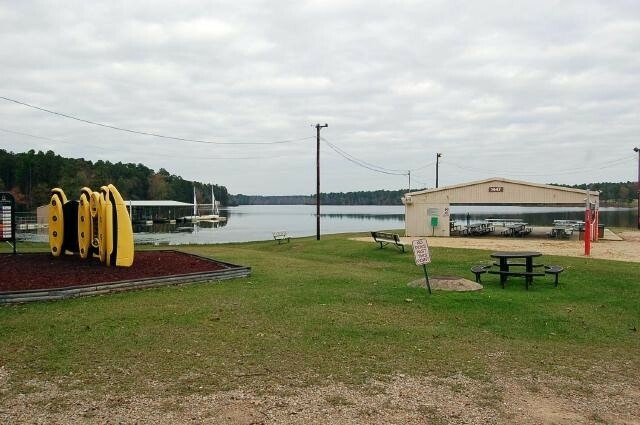 There is great access to the lake, wonderful equipment for rent at terrifically reasonable prices. The staff could not have been nicer. 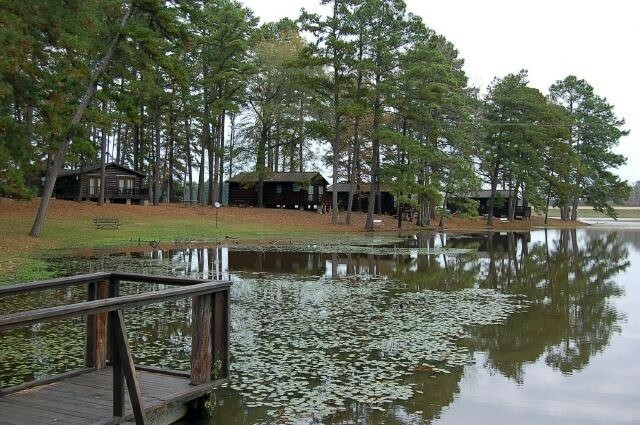 This is a wonderful place for families, with really lovely cabins for those without camping vehicles. We rented a pontoon boat for an entire day's fishing (awesome), took kayaks out on the lake, rode our bicycles, walked and enjoyed the quiet. The laundry and shower facilities were very clean. We will definitely keep this on the list for a return visit. 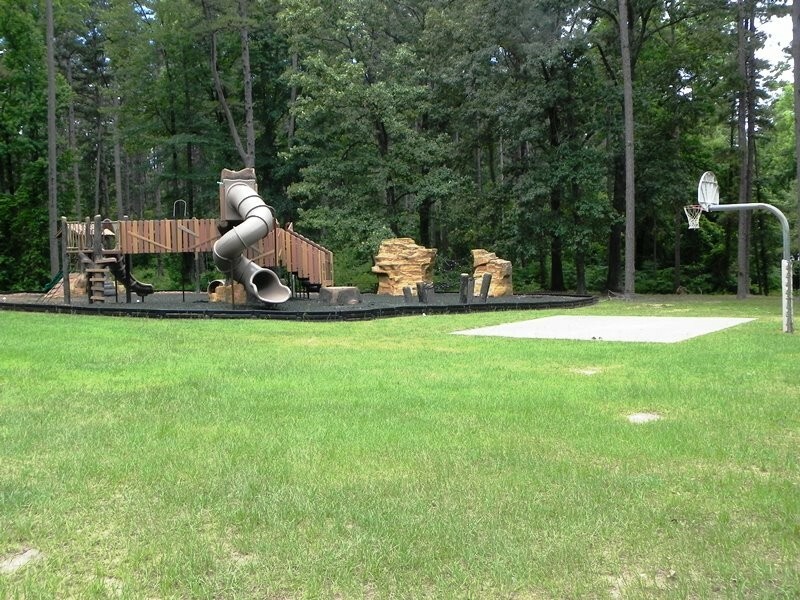 This is just an outstanding campground! Signage is great but it would be difficult to see at night as its awfully dark. Even though they don't take reservations, I called the morning we were coming and the man on the phone told me he'd place a cone in the campsite for us. Sure enough, we got here and we got the last full hook up site. He even told us someone else came before us and he told him the site was taken. We really appreciated that! Everyone at the camp store was so friendly and accommodating. The price of $10 with access pass is just GREAT and about as low as we ever pay as fulltimers. 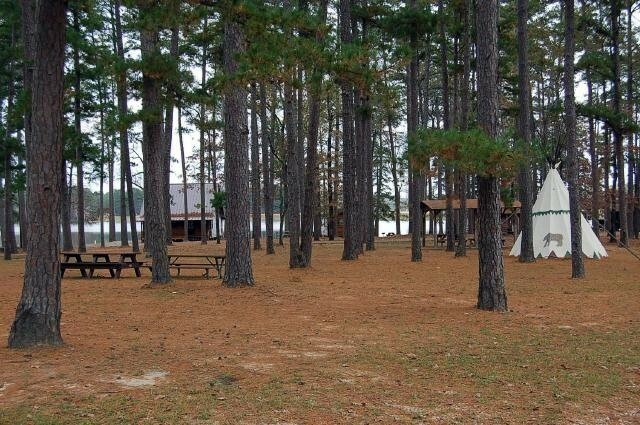 The campsites were far enough apart to suit us and the pine tree setting is just beautiful. We have a 39 foot unit and didn't have too much problem backing into our site but you do have to have long hoses for sewage and water (which we do). We managed to get at least 10 stations on our TV with just the antenna. Verizon wireless worked beautifully here. Yes, getting the MWR badge was a new experience for us, but it was quick and painless and the people were friendly and professional. Nobody told us there were any binocular exclusions so I don't know what that's all about. The gate guards were really great too. Two weeks is the limit to stay here and we're paying day by day as we are waiting for an appointment to get warranty repairs done in Houston on our 5th wheel. We will certainly be back here again. It is really beautiful and the smell of the pines is so relaxing. The free movies and popcorn are on Saturday night and they're new movies, outside, shown on a big screen. OH and we had 50 amp on our site so I don't know about the comment made in 2007. The directions were excellent. 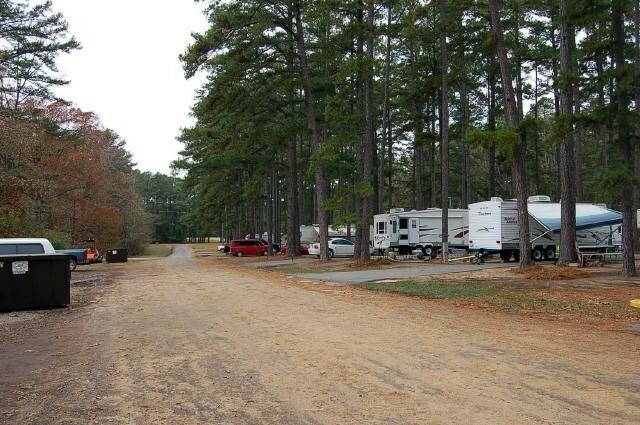 The campgrounds are right 7 miles from the main gate. During our stay all of the full hooks at the country store area were being used. We stayed at a new location, which I believe had 12 sites. This new location is about 1/8 of a mile from the country store. It was excellent. Very clean with very flat pads. (Easy to level the trailer) The restrooms and showers were very clean, however most of the showers were hard to turn on or off. The country store only had limited supplies, but the ladies that worked there were very polite and helpful. Starting in May they will begin the outdoor movies at sundown. The lake was low so they were not renting any of their boats until the lake returns to normal levels. There are signs stating 14 day limits, but it appeared some campers have been there much longer. We will most likely stay here again. In a travel trailer. We stopped for only one night, but wish we had time for a longer stay. 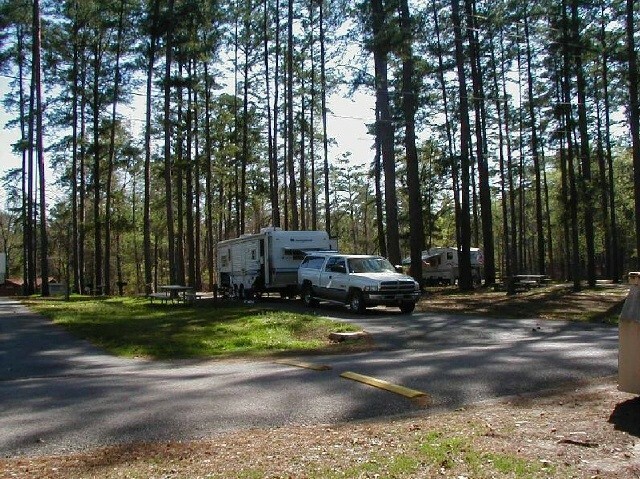 This time of the year, it was real quiet, although the RV sites were about 75% occupied. Located in a quiet corner of the depot, this is pure recreation. LOTS of recreational activities to do here. I bet it's a jumping place during the summer! Lots of trees, so satellite coverage may be difficult to get. Staff was helpful and friendly. The cabins looked pretty neat and would be fun to rent for a week or weekend. I liked how the cabins were spread out on the lake with good views. Some renters even had their bot pulled right up to the shore near them. Prices are PERFECT for a military benefit. This is how ALL military campgrounds should be priced! Second visit here. This time I took a refresher sailing course from Doug White with MWR. He is an excellent instructor. They offer free use of the 4 different sailboats, 18ft Precision, 15ft Precision, 17ft Big Fish, and a cat. If you ever have wanted to learn to sail or even wanted to try it, Doug is your man. Sailing brings a wonderful peace to your soul. Boat and motor rentals are $25 a day or $10 an hour and you need to bring your own anchor unless drifting around while you fish is your thing. They just got some kayaks and they will be able to be used in the near future. I do not know if there will be a rental fee or not. The canoes are $10 a day. Our cabin had two sets of french doors that opened out to the deck which of course overlooked the lake. As usual Teesa, Ricky, and the rest of the staff at the campground were more than wonderful. They are the kind of people that you would want as neighbors. Anyway, if you want peace and quiet in a great setting, this is the place to visit. WOW. This was our first time to visit RRAD and I am sorry that I haven't visited earlier. We rented a cabin. 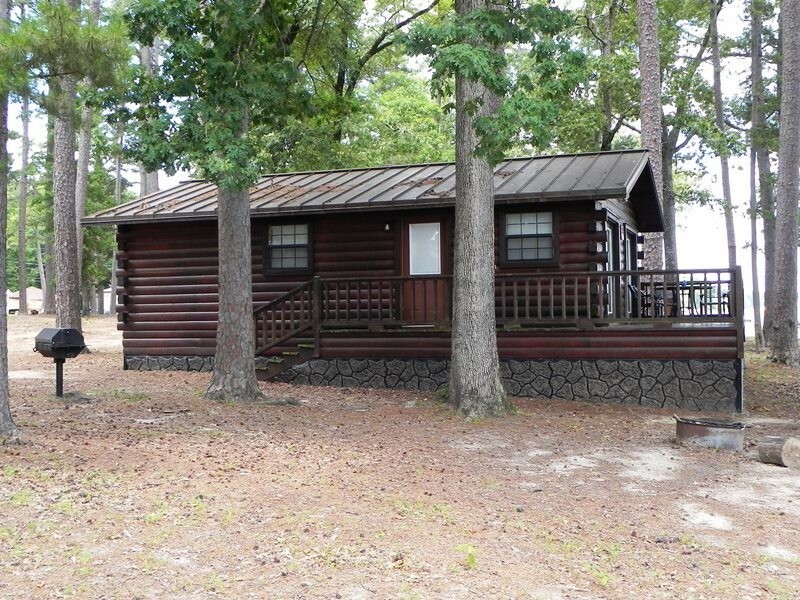 All cabins are on the water, have decks, completely shaded with trees and are nicely furnished. Boat rentals are priced right and the sailboats (3) are free to use if you are ASA certified. The lake itself is large and because it is on a military installation it is like having your own private lake as very few people are boating/fishing. At dusk, the fire flies light up the grounds. Yes it was a hassle getting the MWR badges however the people in Security were friendly and did give fast service. But since when has anything with the government been hassle free? The drive to the lake once inside the gate takes about 10 minutes but you are back in the woods, like campgrounds ought to be. I tip my hat to the MWR staff there. EVERYONE of them treated you like a good neighbor, like a guest in their home. Bring whatever bait you want to use for fishing as they have a small selection of bait in the country store. We will be back at least once a quarter. This is the third time I have stayed here. As usual, the staff were very friendly and willing to help. I arrived late at night and did find a spot. Space 22. Hooked up electric and figured I would hook up the rest in the morning. In the morning, I checked and no sewer hookup. This is the first time I have stayed in this little section. There were 8 or 10 sites there with just electric and water. I mentioned it to the staff and they said they have been there right along. Guess I just never noticed them because they do sit off the rest of the campsites a little. They said they are adding 9 new sites. A lot of construction going on on the base so take it easy driving in. Also, as stated, this was my third time staying here. I have never had to get a "badge" or special pass or anything like that. I have never been asked about binoculars, cameras or told not to use anything like that while on the base. This time I did have a conversation with the gate guard about my GPS, but only because his girlfriend had just bought him one and he was curious. This is a nice campground and I would always stop here when passing through, but this time they were full, at least the sites with sewer hookups. We decided to stop for 7 days traveling from Michigan weather. Rather difficult finding the campground at night, we pulled into the boat launch area and had to unhook our dinghy so that we could turn-around. At the gate we were asked to turn in our binoculars, after doing so the guards did not know what to do with them so they gave them back to me and told me not to use them on-site (which I had no intention of doing). We enjoyed our stay once we settled in and we are planning on stopping again on our way SouthWest. Very peaceful and quiet setting and worth what we paid. Don't forget your badge!